David le Page – whose performance of Tchaikovsky’s concerto was declared a “stunning success” by Herts Advertiser critic John Manning – will this time play the beautiful, but turbulent Violin Concerto by Finnish composer, Jean Sibelius. Born in Guernsey, David le Page started violin lessons at the age of seven. Within five years became a student at the famed Yehudi Menuhin School and later a prize winner in the BBC Young Musician competition. He leads his own group, the Le Page Ensemble, as well as the acclaimed Orchestra of the Swan, based in Stratford upon Avon. 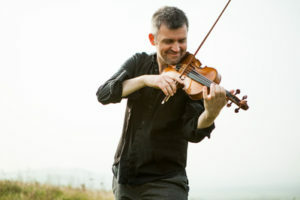 To date he has also recorded three albums of his solo violin playing and three more that feature his own compositions. Although Sibelius’s played the violin himself, he only completed one concerto for the instrument, taking some years to finalise it. Since its first performance in 1904, admirers have characterised it as a work mixing Scandinavian ice with fire; where lyrical purity gives way to dramatic intensity. Among its highlights is a prolonged and brilliant first-movement cadenza for the soloist. Launching an all-Sibelius programme, SASO and their principal conductor, Tom Hammond, will perform the tone poem Finlandia. This has remained the composer’s most celebrated work since he wrote it in 1899 as a Finnish cry for independence from Russia. The programme also includes the evocative Scene with Cranes, originally written as incidental music for a play. In conclusion, the orchestra will play the Symphony No 5, which the Finnish government commissioned to mark the composer’s 50th birthday. For Sibelius, it marked a return to a more optimistic, audience-friendly style of writing after his grim and brooding fourth symphony. The horn theme that dominates the last movement was based on the calls of wild swans and builds towards one of the most heart-warming and affirmative finales in the symphonic repertoire. For further information about tickets, click here.